This is the work any father would proud to display. 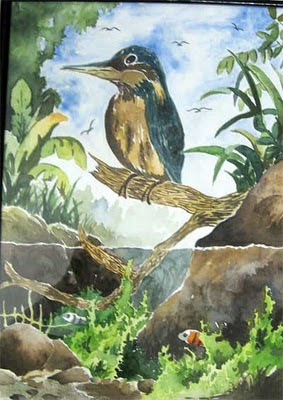 It is that of a kingfisher, painted by my 16 year old daughter in the medium she knows best, watercolour. The painting was her gift to her Biology teacher who had been promoted to the Education Ministry. Comments and critique welcome.